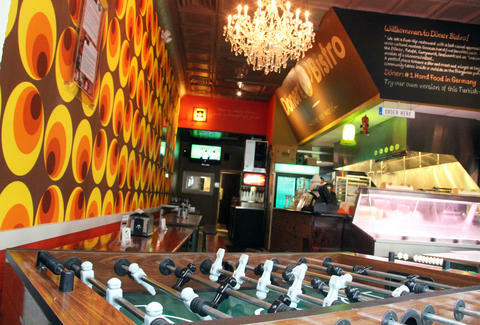 This Deutsch-like house of meat & beer in upper Adams Morgan sports foosball, keg-stools w/ seats made from beer bottle tops, imported German picnic tables, and a radio station blaring "German beats", which the neighbors will very likely not give rave reviews. Considered the "#1 hand food in Germany" (meaning it's like 5x better than finger foods), doner's a "meat cone" made of spit-roasted Turkish spiced chicken or beef, which the Bistro then stuffs into flatbread with a garlic-yoghurt sauce, but they've also got German brats w/ Kűhne mustard, and Wiener Schnitzel. If you just want to booze and foos, grab one of four imported drafts (like Köstritzer Black Lager and Weihenstephaner Wheat), or select from 34 bottles (Gaffel Kölsch, Einbecker Maibock, HB Dunkel...) that're separated by their ABV into categories "1, 2, and 3", so you decide whether you want your head to feel like a tropical storm the next morning. And no, you don't need to have an awesome Jewish last name to be a member of their Stein Club: just buy the glassware from them, and bring it back whenever to get 43% off on refills. Sort of a hassle, but Hoff's on the speakers, so it probably makes sense.